The Caribbean nation of Haiti is the poorest country in the Western Hemisphere. Our St. John’s community has formed a relationship with a sister parish that has helped raise money to add on to the school and provide clean water for the people in Bassin-Bleu in Mole, Haiti. Our sister parish in Mole, Haiti is located in the Northwest corner of Haiti. Fr. Rodolphe, who studied theology at St. Meinrad Seminary in southern Indiana (with Fr Nagel), is the pastor at the parish in Mole. Our missionaries go there to build relationships with the people of that community and discover how we can all help. See below for ways you can help this mission. 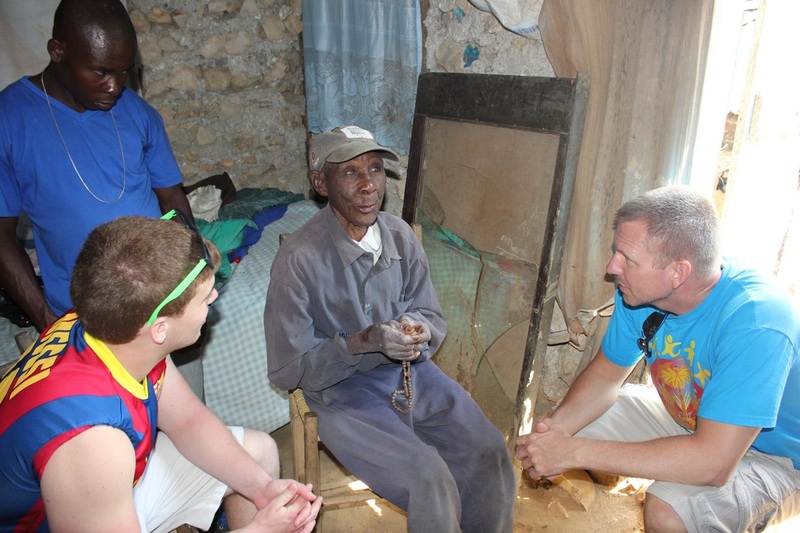 Prayer is one of the best ways we can help our brothers and sisters in Haiti. Make our sister parish part of your daily prayer. Make a monthly contribution to our sister parish, St. Nicolas in Mole, Haiti. Your monthly contribution directly helps to fund teacher salaries, emergency aid, school lunches for the children and structural improvements to facilities. The meal this monthly contribution helps to provide may be the only meal some receive in a given day. Your gift makes a difference! Our current outreach includes providing $1,000 monthly to help with these on-going needs. To make a contribution today, visit our online giving site at: www.stjohnsindy.org/donate/ or drop a check in the collection basket with “Haiti” in the memo. 100% of all gifts are given directly to our sister parish of St. Nicolas. No overhead costs are deducted. Sponsor one of our Haitian brothers and sisters with the gift of education. Sponsorship is available for Seminarians ($1200/yr), University ($1200/yr) and High School ($160/yr). Thanks for your generosity. There is an annual mission trip to our sister parish. Applications are accepted in the winter for a March Mission. Watch the bulletin and weekly emails for more information each year. Each year we do a special fund raising event for the Haiti Ministry. These funds go towards a special project. In the past we have built a church, schools, rectory, convent and installed water purification systems. If you are interested in helping plan and implement a special event, we can use your help!